This is just the kind of craft that my 4 year old loves, loves, loves to play with when I'm done making it. I often have to wrestle these craft felt creations from her for a few minutes in order to take a quick photo for the blog. 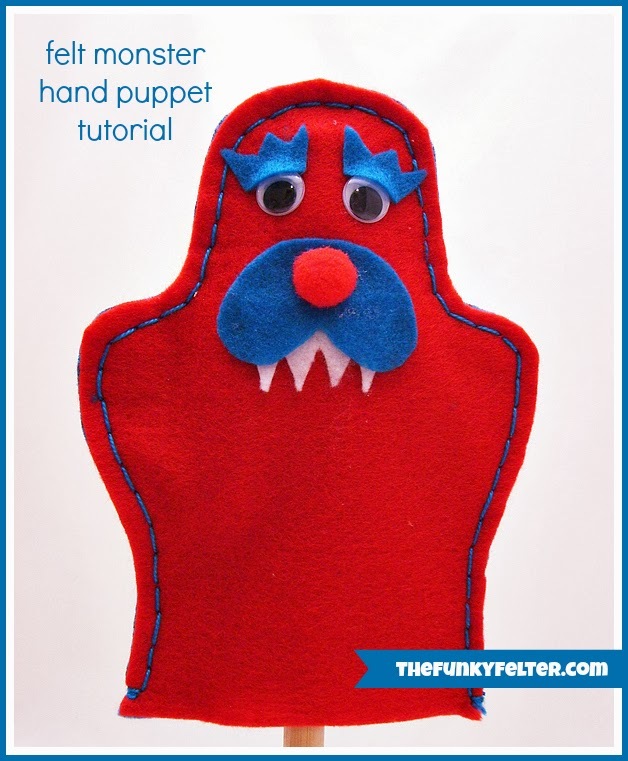 This cuddly felt monster puppet can be made in whatever colors your kiddo likes best. Easily cut out and make multiples for a kid's party or make your own craft kits for a group of kids to create their very own monsters. Craft Tips: I hand stitched the edges on this little monster, but you could easily machine sew the edges or adhere them together with the hot glue gun or other sturdy permanent glue. As always, use caution with a hot glue gun around young children. Be sure the adults in charge do the assembly! First click on the link above to access the free printable. Download and print the pattern. Size the pattern up or down as needed to fit your child's hand. Using the red craft felt sheets, cut out two pieces for the monster's body according to the pattern. Then cut out pieces of blue craft felt for the eyebrows and mouth and pieces of white craft felt for the jagged teeth. Using the hot glue gun, adhere the wiggle eyes onto one of the body pieces. (See photo for approximate placement of all pieces.) Then adhere the eyebrows on top of the eyes slightly. Only adhere at the bottom edge of each eyebrow leaving the top unglued. In the same manner, adhere the jagged teeth next a couple inches below the eyes. Then adhere the mouth and pompom nose on top of the teeth. Next align the front and the back body pieces. Either hand stitch, machine sew or glue the edges in place all around the monster's body. Leave the straight bottom edge open to insert a hand for the puppet. Now go make several and pass them out to an excited group of kiddos!